Introduction: Historically our culture has traditionally viewed even the normal menustral cycle as an aberration, ostracizing the reproductive aged women. Aristotle quoted Hippocrates writings by describing the process of heavy uterine bleeding as "In quantity, bleeding in excessive, saith Hippocrates, when they flow about eighteenth ounces". Aims and Objective: To study the various aetiopathological factors responsible for AUB in women ages 20-55 years, and to correlate the clinical presentation with ultrasonography, hysteroscopy, laparoscopy and histopathological finding. Sample: In this study, 140 cases of 15-55 years of age group were randomly selected after the exclusion criteria who were willing to get admitted as well as prepared for follow-up. Inclusion Criteria: The cases of abnormal uterine bleeding, attending the gynecology OPD with complaints of menorrhagia, metrorrhagia, polymenorrhoea, and polymenorrhagia in the age group 20-55 years, were selected. Exclusion Criteria: Pregnant patients and patients below 20 years and above 55 years are excluded from the study. Conclusion: It is seen that incidence of AUB is more common in 5 th decade of life and in multiparous women. Menorrhagia is the most common bleeding pattern followed by metrorrhagia. Histopathological examination of the endometrium revealed that whatever may be the pathology, proliferative endometrium is the most common pattern. Abnormal uterine bleeding (AUB) is one of the most common conditions for which women consult their gynecologists. AUB may be defined as any variation from the normal menstrual cycle, including alteration in its regularity, frequency of menses, duration of flow, and amount of blood loss. Under the category of AUB, further definitions may be subdivided based on volume of menstruation, regularity, frequency, duration, chronicity, and timing related to reproductive status. AUB can occur at any age in various forms and has different modes of presentation. Abnormal uterine bleeding during reproductive age can result from a broad spectrum of conditions ranging from physiological process to malignant lesions involving organic, systemic, and hormonal responses. It may be due to fibromyoma, adenomyosis, endometrial polyp, ovarian tumor, pelvic inflammatory disease (PID), endometrial hyperplasia, endometrial carcinoma, hormonal imbalance (like hypothyroidism), or hypothalamic-pituitary diseases. In a large number of patients, AUB occurs without any systemic causes or any organic lesions of the genital tract and for this, the term dysfunctional uterine bleeding is used. AUB interferes with a woman's physical, social, emotional quality of life. It has been seen that women with heavy bleeding of unpredictable onset take a step back from participating in routine activities, as they may require continuous access to pads and/or tampons, and they have a fear of social activity or sexual relationships because they perceive that they are on the precipice of a heavy period. In many cases, the symptoms will be relatively minor and related to self-limiting alterations in normal physiology. The key to successful clinical management is to recognize or identify the causative factors responsible. The first aim of the clinician is to reverse the abnormality and induce or restore the cyclic predictable menses of normal volume and duration. This can be achieved by thorough clinical examination, ultrasonography and histopathological examination. When no systemic and pelvic cause is evident to clinician, histopathological examination remains the only alternative to reach the diagnosis, after ruling out the organic causes. The clinician is left with patients for whom no definite diagnosis is made except that the bleeding is dysfunctional. To study the various aetiopathological factors responsible for AUB in women ages 20-55 years, and to correlate the clinical presentation with ultrasonography, hysteroscopy, laparoscopy and histopathological finding. "Clinicopathological Evaluation of Abnormal Uterine Bleeding" was conducted during the period of September 2012-January 2014 in the department of Obstetrics and Gynecology, Hi-Tech Medical College, Bhubaneshwar. In this study, 140 cases of 15-55 years of age group were randomly selected after the exclusion criteria who were willing to get admitted as well as prepared for follow-up. The cases of abnormal uterine bleeding, attending the gynecology OPD with complaints of menorrhagia, metrorrhagia, polymenorrhoea, and polymenorrhagia in the age group 20-55 years, were selected. Pregnant patients and patients below 20 years and above 55 years are excluded from the study. The [Table 1] shows incidence of abnormal uterine bleeding between age group 15-55 years. In our clinical study, AUB was commonly seen among 40-45 years of age group. 10 cases (7.1%) are in age group 20-25 years, 12 (8.6%) cases are in age group 26-30 years, 29 (20.7%) cases are in age group 31-35 years, 35 (25%) cases are in the age group 36-40 years, 52 (37.2%) cases are in the age group 41-45 years, and very few cases are seen in the age group of 46-55 years. [Table 2] shows the majority of AUB cases belong to low socioeconomic status (67.2%), as compared to cases belonging to high socioeconomic status (32.8%). This table shows the incidence of various types of abnormal uterine bleeding. Menorrhagia and metrorrhagia were found in 68 (48.6%) and 32 (22.9%) cases respectively. Incidence of polymenorrhagia were found in 24 (17.1%) cases, polymenorrhoea in 14 (10.0%) cases and continuous bleeding in 2 (1.4%) cases [Table 3]. The above table shows that among 140 patients, 135 patients had normal Pap smear More Detailss and 5 patients had abnormal pap smears. The 5 patients' subsequent coloposcopy findings were normal. This table shows different endometrial pattern associated with abnormal uterine bleeding. Out of 140 cases, an endometrial biopsy was done in 136 cases and in 4 cases endometrial biopsy was not done. Proliferative endometrium was found in 64 (45.7%) cases, secretory endometriumin 42 (30%) cases, and hyperplastic endometrium in 17 (12.1%) cases. Atrophic endometrium was found in 7 (5%) cases. Endometrial polyp and endometrial carcinoma were found in 5 (3.6%) cases and 1 (0.7%) cases respectively [Table 4], [Table 5], [Table 6]. [Table 7] shows that cystic hyperplasia was common among the AUB patients i.e., 70. 6% and atypical hyperplasia was seen in only 11.8% cases. [Table 8] shows the endometrial pattern found in dysfunctional uterine bleeding. 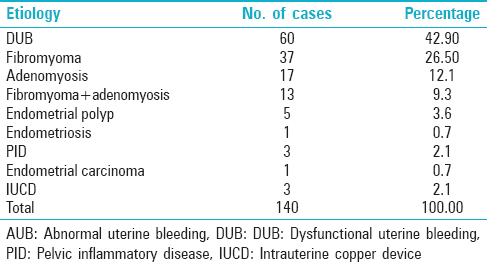 Out of 60 cases, dysfunctional uterine bleeding (DUB), endometrial biopsy was done in 59 cases. Out of 59 cases, proliferative endometrium was found in 26 (43.3%) cases, secretory in 14 (23.4%) cases and hyperplastic in 13 (21.7%) cases. 6 (10.0%) cases of DUB were found to have atrophic endometrium. It is concluded that DUB is the most common cause of AUB, and which is also mostly of anovulatory type. Among the other organic pathological causes, fibromyoma is the commonest cause followed by adenomyosis. The age distribution of AUB in our study revealed that 37.9% of cases belonged to 5 th decade (41-50 years) as mentioned in [Table 1]. Saraswathi et al. in 2011 reported that 33.5% of cases belonged to 41-50 years which was similar to our study. Similarly the study conducted by Abdulla et al., 2011 showed 33.1% cases of AUB in 5 th decade which coincides with the present study. The studies conducted by Jetley et al., 2012 and Zeeba et al., 2013 reported that 35.89% and 35.9%, respectively, of cases belonged to 5 th decade and this is in concordance with our study. The reason for increased incidence of abnormal uterine bleeding in this age group (41-50 years) may be due to the fact that these patients are in their climacteric period. As women approach menopause, cycles shorten, and often become intermittently anovulatory due to a decline in the number of ovarian follicles and their increased resistance to gonadotrophic stimulation causes decline in estradiol level, which cannot keep the normal endometrium growing. In this study, our patients presented with different types of AUB; the commonest presenting feature was menorrhagia (48.6%). Nayak et al., 1996 found menorrhagia in 49.1% of cases similar to our study. Similarly Bagle et al., 2013 reported in their study that 48.8% of cases had menorrhagia. The study conducted by Aseel Ghazi Rifat et al., 2014 reported 47.2% of cases with menorrhagia, which is similar to our study. The second common pattern of bleeding is metrorrhagia, which accounts for 22.9% of cases. Saera Afghan et al., 2013 reported 20.6% of cases of metrorrhagia, which is almost similar to our study. Kalpana R Sulhyan et al., 2014 reported 23% cases of metrorrhagia in concordance with our study. Muzaffar et al., 2005 reported 35.4% of metrorrhagia cases which is high, the reason might be the pregnancy related complications and endometritis due to abortion which are excluded in our study. In our study, polymenorrhagia and polymenorrhoea accounts for 17.1% and 10% of cases respectively, which is similar to the study of Tyagi et al., 1996. The study conducted by K Rajani et al., 2014 reported polymenorrhagia in 13.7% of cases and 8.24% in polymenorrhoea, almost similar to our study. Pap smear was taken in all 140 cases and among them only 3.6% of cases had abnormal smear. Those cases were followed up with a coloposcopy, whose findings appeared normal. Biniwale et al. 2014 observed in their study that 95% of cases had normal papsmear and 3. 96% had abnormal smear which is similar to our present study. Histopathological evaluation revealed proliferative endometrium in 45.7% and secretory in 30% of cases in our study. Zawar et al., 2005 reported 43% cases of proliferative endometrium in their study. Doddamani et al., 2014 observed proliferative endometrium in 44.7% and secretory in 23.5% of cases which is almost similar to our study. The secretory phase is 30% in our study; the higher incidence is attributed to inclusion of hormonal treatment taken for menstrual irregularities. Siegel et al., 2012 reported 30.9% of cases of secretory endometrium in their study which is similar to the present study. In this study, an attempt has been made to find out the different aetiological factors of AUB and to correlate the clinical presentation with ultrasonography, hysteroscopy and histopathological examination for each case. It is seen that incidence of AUB is more common in 5 th decade of life and in multiparous women. Menorrhagia is the most common bleeding pattern followed by metrorrhagia. Histopathological examination of the endometrium revealed that whatever may be the pathology, proliferative endometrium is the most common pattern. It is concluded that DUB is the most common cause of AUB and which is also mostly of anovulatory type. Among the other organic pathological causes, fibromyoma is the commonest cause followed by adenomyosis. Transvaginal sonography is a noninvasive method in diagnosis of endometrial abnormalities. Laparoscopy appears to be the gold standard method for detection of endometriosis. Hysteroscopy is also a safe, highly sensitive diagnostic procedure that provides useful information about the uterine cavity and represents an ideal method in detecting intracavitary abnormalities. Accurate diagnosis is crucial for selection of relevant treatment of AUB and the avoidance of unnecessary major surgical procedure. Collins J, Crosignani PG; ESHRE Capri Workshop Group. Endometrial bleeding. Hum Reprod Update 2007;13:421-31. Breijer M, Timemermans A, van Doorn HC, Mol BW, Opmeer BC. Diagnostic strategies for postmenopausal bleeding. Obstet Gynecol Int 2010;2010:850812. Bradley H, Nezhat F. Hysteroscopy. In: Nezhat C, editor. Nezhat′s Operative Gynecologic Laparoscopy and Hysteroscopy. New York: Cambridge University Press; 2008. p. 577-9. Baggish M, Guedj H, Valle R. General aspects of operative hysteroscopy. In: Baggish M, Guedj H, Valle R, editors. Hysteroscopy: Visual Perspectives of Uterine Anatomy, Physiology and Pathology. 3 rd ed. London: Lippincott Williams and Wilkins; 2007. p. 330-59.
van Dongen H, de Kroon CD, Jacobi CE, Trimbos JB, Jansen FW. Diagnostic hysteroscopy in abnormal uterine bleeding: A systematic review and meta-analysis. BJOG 2007;114:664-75. Nikolaou D, Salman G, Richardson R. Operative hysteroscopy in the outpatient in the outpatient setting: Its role within a gynaecology service. Gynaecol Surg 2009;6:21-4. Singhi A. Comparison of complications rates in endoscopic surgery performed by a clinical assistent vs. An experienced endoscopic surgeon. J Gynecol Endosc Surg 2009;1:40-6. Baggish M. Anatomy of the uterus. In: Baggish M, Guedj H, Valle R, editors. Hysteroscopy: Visual Perspectives of Uterine Anatomy, Physiology and Pathology. 3 rd ed. London: Lippincott Williams and Wilkins; 2007. p. 15-30. Lasmar RB, Dias R, Barrozo PR, Oliveira MA, Coutinho Eda S, da Rosa DB. Prevalence of hysteroscopic findings and histologic diagnoses in patients with abnormal uterine bleeding. Fertil Steril 2008;89:1803-7. Sunitha CH. A Clinical Study of Diagnostic Hysteroscopy in Abnormal Uterine Bleeding and its Histopathological Correlation (dissertation). Bijapur: Shri B. M. Patil Medical College Hospital and Research Centre; 2006. p. 236. Decloedt JF, Fenton DW. Outpatient hysteroscopy: Indications and hysteroscopic findings in pre-and postmenopausal patients. Gynaecol Endosc 1999;8:137-41.
de Jong P, Doel F, Falconer A. Outpatient diagnostic hysteroscopy. Br J Obstet Gynaecol 1990;97:299-303. Dibi RP, Zettler CG, Pessini SA, Ayub AV, de Almeida SB, da Silveira GP. Tamoxifen use and endometrial lesions: Hysteroscopic, histological, and immunohistochemical findings in postmenopausal women with breast cancer. Menopause 2009;16:293-300. Cove H. Surgical Pathology of the Endometrium. 5 th ed. Lippincott Williams and Wilkins; 1981. p. 72-7. Fleihmann CF. Text Book of Menstrual Disorder and Treatment. 16 th : Blackwell; 1956. p. 306. William BJ, Roberston. The Abnormal Menstrual Cycle: Text Book of Endometrium. 4 th : Butterworth; 1981. p. 45-72. Brown R. Clinical fractures associated with endometrial carcinoma. J Obstet Gynaecol Br Commonw 1974;81:933-9. Dallenbach - Hellwag G. Histopathology of the Endometrium. Berlin: Springer Verlag; 1981. p. 26-31. Eufinger H. Zir Frage den Menstruation S Mechanismus. Geburtshife Fraunenheilkd 1952;12:1014. Steive H. Angeblich Sterile Zeiten im Leben geschlechtsluchliger frauen. Z Geburtshilfe Gynakol 1952;136:117. Schmidt - mathieren H. Histochemische ontersuchungen der endometrium - Ground substans. Acla Histochem (Jena) 1962;13-129. Taubert HD. Luteal phase insufficiency contributions to Gynecology and obstetrics 4:78:113, the endometrium in pregnancy. Am J Anat 1978;77:365. Fox H, Buckley CH. Pathological factors involved in infertility. In Blausterin A, editor. Pathology of the Female Genital Tract. Springer Verlag; 1982. p. 828-37. Ancla M, Debrux J, Musset R, Bret JA. Etrude au microscope electronque de ′l′ endometre human dans differentes conditions ′d′ equilibre hormonal Archieves ′d′. Anatomic Pathologique 1967;15:136-45. Thomas R, Reid RL. Thyroid disease and reproductive dysfunction: A review. Obstet Gynaecol 1987;70:789-98. Mazzaferri EL. Evaluation and Management of common thyroid disorders in women. American J Obstet Gynecol 1997;176:507-14. Kistner RW. Gynecological Principles and Practice. Chicago: Year Book Publishers; 1964. p. 238. Novak ER, Jones JS, Jones HW. Novak′s Textbook of Gynecology. 8 th ed. Baltimore: Lippincott Williams and Wilkins; 1971. p. 319. Leiserowitz GS, Paik CK. Abnormal uterine bleeding. Manual of Out Patient Gynaecology 1998;4:119-31. Rosenberg IN. Menstrual instability in thyroid disease. Clin Obstet Gynecol 1969;12:755-70. Beer AE. Differential diagnosis and clinical analysis of dysfunctional uterine bleeding. Clin Obstet Gynecol 1970;13:435-50. Jenny JM, Shaw RW. The effect of thyroxine replacement on menstrual blood loss in a hypothyroid patient. Br J Obstet Gynaecol 1992;99:695-6. Scott JC Jr, Mussey E. Menstrual patterns in myxedema. Am J Obstet Gynecol 1987;90:161-5. Ben-Yehuda OM, Kim YB, Leuchter RS. Does hysteroscopy improve upon the sensitivity of dilatation and curettage in the diagnosis of endometrial hyperplasia or carcinoma? Gynecol Oncol 1998;68:4-7. Bettocchi S, Ceci O, Vicino M, Marello F, Impedovo L, Selvaggi L. Diagnostic inadequacy of dilatation and curettage. Fertil Steril 2001;75:803-5. Gimpelson RJ. Panoramic hysteroscopy with directed biopsies vs. dilatation and curettage for accurate diagnosis. J Reprod Med 1984;29:575-8. Fleischer AC, Wheeler LE, Lindsay I, Hendrix SI, Grabill S, Kravitz B, et al. An assessment of the value of ultrasonographic screening for endometrial disease in postmenopausal women without symptoms. Am J Obstet Gynecol 2001;184:70-5. Apgar BS, Greenberg G. Using progestins in clinical practice. Am Fam Physician 2000;62:1839-46, 1849-50. DeVore GR, Owens O, Kase N. Use of intravenous Premarin in the treatment of dysfunctional uterine bleeding-a double-blind randomized control study. Obstet Gynecol 1982;59:285-91. Lethaby A, Augood C, Duckitt K. Nonsteroidal anti-inflammatory drugs for heavy menstrual bleeding. Cochrane Database Syst Rev 2004 2002;CD000400. Lethaby AE, Cooke I, Rees M. Progesterone/progestogen releasing intrauterine systems versus either placebo or any other medication for heavy menstrual bleeding. Cochrane Database Syst Rev 2000;CD002126. Fraser IS, McCarron G. Randomized trial of 2 hormonal and 2 prostaglandin-inhibiting agents in women with a complaint of menorrhagia. Aust N Z J Obstet Gynaecol 1991;31:66-70. Sowter MC, Lethaby A, Singla AA. Pre-operative endometrial thinning agents before endometrial destruction for heavy menstrual bleeding. Cochrane Database Syst Rev 2002;CD001124. Lethaby A, Farquhar C, Cooke I. Antifibrinolytics for heavy menstrual bleeding. Cochrane Database Syst Rev 2000;CD000249. Abbott J, Hawe J, Hunter D, Garry R. A double-blind randomized trial comparing the Cavaterm and the NovaSure endometrial ablation systems for the treatment of dysfunctional uterine bleeding. Fertil Steril 2003;80:203-8. Aletebi FA, Vilos GA, Eskandar MA. Thermal balloon endometrial ablation to treat menorrhagia in high-risk surgical candidates. J Am Assoc Gynecol Laparosc 1999;6:435-9. AlHilli MM, Hopkins MR, Famuyide AO. Endometrial cancer after endometrial ablation: Systematic review of medical literature. J Minim Invasive Gynecol 2011;18:393-400. Amin-Hanjani S, Good JM. Pyometra after endometrial resection and ablation. Obstet Gynecol 1995;85:893-4. Amso NN. Clinical and health service implications of second generation endometrial ablation devices. Curr Opin Obstet Gynecol 2006;18:457-63. Amso NN, Fernandez H, Vilos G, Fortin C, McFaul P, Schaffer M, et al. Uterine endometrial thermal balloon therapy for the treatment of menorrhagia: Long-term multicentre follow-up study. Hum Reprod 2003;18:1082-7. Andersson S, Mints M. Thermal balloon ablation for the treatment of menorrhagia in an outpatient setting. Acta Obstet Gynecol Scand 2007;86:480-3. Basak S, Saha A. Adenomyosis: Still largely under-diagnosed. J Obstet Gynaecol 2009;29:533-5. Baskett TF, Clough H, Scott TA. NovaSure bipolar radiofrequency endometrial ablation: Report of 200 cases. J Obstet Gynaecol Can 2005;27:473-6. Hillis SD, Marchbanks PA, Tylor LR, Peterson HB. Higher hysterectomy risk for sterilized than nonsterilized women: Findings from the U. S. Collaborative Review of Sterilization. The U. S. Collaborative Review of Sterilization Working Group. Obstet Gynecol 1998;91:241-6. Hoffman MK, Sciscione AC. Placenta accreta and intrauterine fetal death in a woman with prior endometrial ablation: A case report. J Reprod Med 2004;49:384-6. Huchon C, Fritel X. Epidemiology of menometrorrhagia. J Gynecol Obstet Biol Reprod (Paris) 2008;37(Suppl 8):S307-16. Jack SA, Cooper KG, Seymour J, Graham W, Fitzmaurice A, Perez J. A randomised controlled trial of microwave endometrial ablation without endometrial preparation in the outpatient setting: Patient acceptability, treatment outcome and costs. BJOG 2005;112:1109-16. Jamieson R, Hammond I, Maouris P. Small bowel perforation associated with microwave endometrial ablation. Aust N Z J Obstet Gynaecol 2002;42:407-8. Jarrell A, Olsen ME. Patient satisfaction with thermal balloon endometrial ablation. A retrospective review. J Reprod Med 2003;48:635-6.